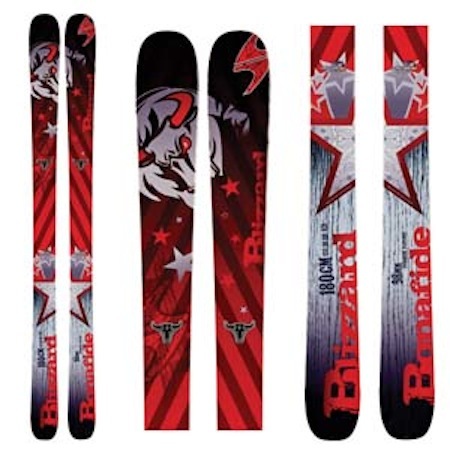 The Blizzard Bonafide and other new skis (Cochise/Bodacious) have converted a lot of people over to Blizzard, and it’s very easy to see why this ski racked up so many awards …. it has got to be, hands-down, one of the best all-round, one-quiver ski out there. I have spent a lot of time on a lot of great skis, and this is one of my all-time favorites, a very user-friendly, yet uncompromised, true, do it all board. I am continually impressed every time I try it in some new terrain/snow/situation. The only thing I don’t care for is the metal stamp bull logo glued to the top sheet – there are enough bulls going around already. And mine ripped off after a month. The Bonafide is wood-core, slightly damp, not-too-stiff, and a great gripper, boosted by it’s performance as floater in pow and mank. I find the Bonafide very responsive, easy to get on edge quickly, easy to get to speed, easy to ditch speed, easy to lay down a long smooth arc. In powder, there’s plenty of float, and the early rise tip and tail provide a bit of forgiveness and ease-of-use that isn’t watered-down at all. This ski charges despite it’s being so user-friendly, and will take anything you throw at it. Even with its two sheets of metal and a real, traditional structural sidewall, this ski is great for backcountry use at 8.5 lbs per pair for 180cm. (Of note, I have not yet skied the Blizzard Kabookie, which is the Bonafide without the metal, and hence, considerably lighter. I need to try that ski out to see how it performs in a mixed-bag of backcountry conditions without the metal. If it felt the same/similar, then there is the ideal backcountry ski, except for on the deepest of days. I have been skiing the Bonafide, almost exclusively this season, in the backcountry and resort, in every condition imaginable. I am definitely impressed, and would not hesitate to buy another pair. I actually want to get a backup as well as a step-up for deeper days. But that said, the Bonafide performs great in the pow as well, with a nice, wide, yet unobtrusive tip and shovel, which really helps levitate and keep you above it all very nicely. This shovel setup helps you float, yet ditch speed with a quick slash and whip turns very quickly in powder. The slightly larger shovel size is a huge advantage. The tip and tail have a slight rocker, nothing major by any means, and the Bonafide skis more like a traditional ski, though the advantages of the rocker in the tip are really felt during pow sessions. The sizing is interesting, and something that helps with usability. Most people will probably size down a notch, even though the recommendation is to size up. I normally ski a 184, and the Bonafide comes in a 180 and 187. Because I am using these for backcountry and resort, I went 180. It may not seem like a lot, but the 4 cm difference really creates and enhances the versatility, especially in the backcountry. It skis like a 184, but whips easily like a 180. Never ever wanted it much longer. Blizzard uses what they call a Flip-Core for rocker – The Blizzard answer to all the rocker buzz is the new Flip Core 3D technology. The idea: the wood core of the ski is inserted upside-down, so that the downward-facing, convex side of the core creates a natural bend. This natural rocker-shape is already built into the construction of the ski, not needing any additional re-pressing. A revolutionary construction-technique, which is equally as individual as the target groups it speaks to. More good news: the Bonafide remains unchanged for 2013-2014.